How to estimate whether you have a good work by six criteria? 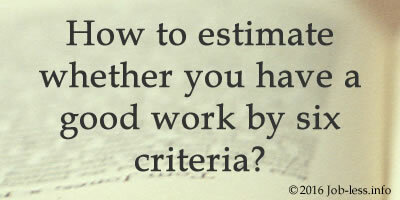 Article #12: How to estimate whether you have a good work by six criteria? People of all ages holding any positions in companies, men and women with scanty or huge income, - all of them from time to time ask themselves, whether they have chosen place of work correctly. Such doubts can pursue both the yesterday's graduate, and the expert of pre-retirement age. How to evaluate your job and what you do at work? Let's try to choose the best criteria. 1. Is it work or career? Work is what we do for the sole purpose, obtaining money to live on. So its loss turns into the only problem, lack of finance. While career develops a person as the professional; also it affords prospects for growth in the organization and on a labor market. Work can be useful in student's time when the only purpose is receiving money so as to visiting night clubs. In any case, thinking of the future specialist should choose a career development. And it is the only way for those who want to reach the tops of organization. 2. Do you feel a passion? The luckiest people are those who have turned a hobby into his own work. However, it is difficult to imagine that someone since the childhood is fond of insurance risks analysis or banking investment. But even in these areas there are professionals who have a passion in regards to what they do. Does such fire burn in your soul? Whether you get pleasure from work? Remember that the indifference rarely becomes the companion of the successful person. 3. Are you proud of what you are doing? Would you do your work if all local newspapers wrote about each your action? What do you feel at that moment, when somebody asks you, "what do you do?" In order to develop pride of your own job, it is necessary to imagine those people to whom your work helps, doing their life easier and more pleasant. Perhaps it will be difficult to do, but you can definitely try! 4. How will this work influence on your summary? What will say a person, reading mention about your present work in your CV? Does such work say about your ability to develop, control yourself under stress and successfully interact with others; about your responsibility, ethics or other positive qualities? Or will this fact simply specify that you were not employed by anybody else at that time? 5. What are the opportunities to develop a network of contacts gives you today's work? One of the main values of the expert was and remains establishing links with those who can be useful. Whether your company is famous for what the managers who have left it become leaders of other firms? Do you often go on business trips and visit places where it is possible to make acquaintances with recognized authorities in business? How many new business cards appear at you in a week? All this can be used and after leaving from current job. 6. What are the alternatives? It makes no sense to criticize something if you cannot offer a better replacement. Which companies you can exchange the one with which cooperate now? And maybe it is time to think about starting a business? After all, sometimes even basic knowledge becomes enough to start your own business. Always think about "alternate airfield" or "Plan B". Good luck to you in climbing to the snow-capped peaks of professional success!